For over 30 years my wife and I have tented in many of our provincial parks. Two years ago she said she was now too old for tents so we purchased a Jayco 14.5 foot travel trailer. We were amazed at the comforts this provided and also the increase in camping trips and nights spent out that resulted. September the 27th is a special day for us and this year represented our 35th wedding anniversary. 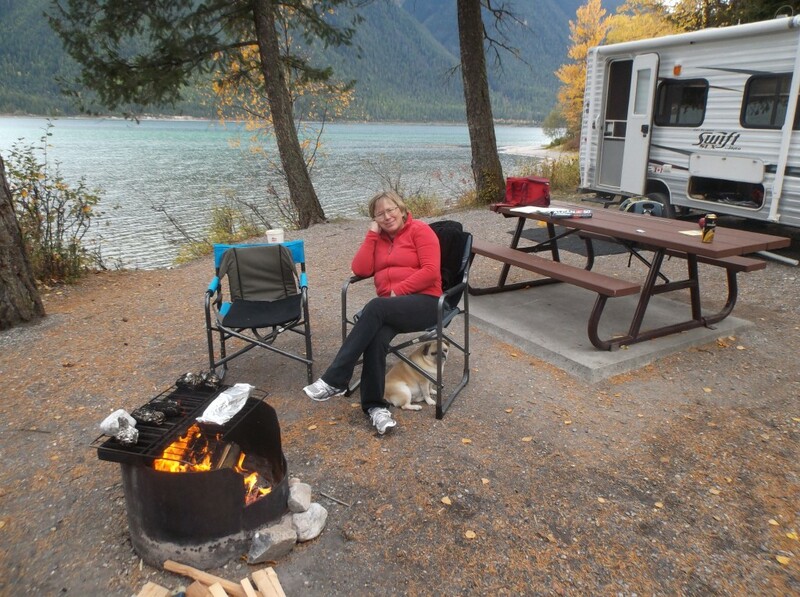 We decided the best way to celebrate would be to spend the weekend camping and fishing at one of our favorite places, Home Basin at Whiteswan Lake Provincial Park. The great thing about fall camping is the availability of waterfront camp spots and we were not disappointed. After setting up the trailer and unloading the boat we had our own private lakefront resort. Our meal menu featured fresh caught rainbow trout for dinner with baked potatoes, roasted garlic and beats. Being experienced fisherman we took along a can of beans for backup. After a few hours cruising the lake Ginny caught a lovely 1.5 pound trout enabling the can of beans to live for another day. The meal was to perfection and there is no greater gift than sitting around the campfire having a toast or two with the one you love the most. The following day had rain in the forecast but the weatherman must have been misled as we woke to clear blue skies with fall colors reflected on a glassy lake. The five hours after coffee and breakfast were spent cruising the lake admiring the majestic views and for a touch of excitement catching 3 more fish. In the late afternoon after loading up we headed home both agreeing that it had been one of our best anniversaries yet. Spotting the moose feeding in a road side pond on the drive down was just a bonus. We do live in the greatest place on earth – thank you B.C.Parks. 0 thoughts on "Our Anniversary Cruise-Whiteswan Lake"